Bahrain-based Dilmunia Mall Development Company said work is in full swing at its BD52 million ($137 million) family-centric retail destination, Mall of Dilmunia which is coming up over a 26,754-sq-m area in the heart of Dilmunia Island, within the Muharraq Governorate of the kingdom. A first-of-its-kind retail destination in the kingdom, Mall of Dilmunia is scheduled to open by this October. 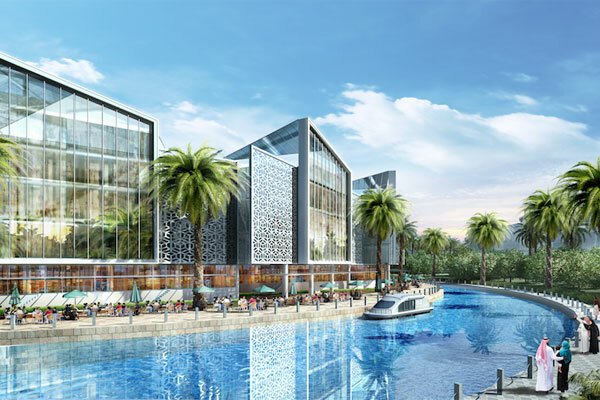 The crescent-shaped mall will overlook a beautiful canal and a lush green landscape that is also complemented by the greenery within the mall. It will also boast innovative concepts such as a huge screen that can project images of the sky, clouds and fireworks – along with sounds. Once ready, the mega project will feature than 200 retail outlets on a total built-up area of 125,000 sq m (with a spacious underground car-park) besides the kingdom's first state-of-the-art indoor ice-rink, said a statement from Dilmunia Mall Development Company. From dining alfresco style, premium entertainment, funscape and lots of retail options, Mall of Dilmunia will be a place for everything, stated the developers. With a gross leasable area of 47,300 sq m, the family-centric destination will feature unique entertainment centres, spectacular new retail outlets besides a wide range of F&B (food and beverages) concepts from across the Middle East and North Africa region and a layout unlike any other mall in the country, they added.